The Alexa Mobile Accessory (AMA) Kit uses a combination of state and Media Control commands to control music playback for a user. For accessory use cases involving music playback, the AMA Kit uses Media Capability and Audio Video Remote Control Profile (AVRCP) controls in collaboration. This page discusses the expected sequence of interactions for AMA Kit use cases involving music playback. The Media Control interactions differ a bit when a user initiates music playback through the Alexa app. For this scenario, the accessory does not use AVRCP commands because of a limitation with iOS that prevents background audio from becoming the active player. Because of this limitation the phone cannot accept AVRCP commands. Use the Media Capability to work around this problem. 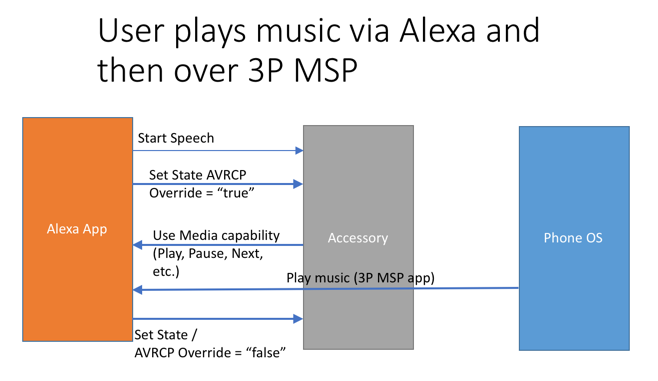 To enable the Media Capability from the accessory to phone, the Alexa app sets the “AVRCP Override” state to "true". The user initiates music through Alexa, issuing a command such as "Alexa, play music." The accessory continues with the same interaction model as specified in the Speech recognition section of AMA Protocol Specifications page. The Alexa app sends a Set State message with an AVRCP Override set to "true" so that it can use the Media Control commands. This step reconfigures the button presses previously used for AVRCP to now use the Media Capability Control messages. The user now controls music through the regular physical button interaction. At some later point in time, the user initiates music playback through the 3P MSP app. The Alexa app sets the state with the AVRCP override set to "false". Continue with the interaction model for a user initiating music playback locally, as described in the previous use case.